Stress. It is everywhere around us. Even worse, it gets inside us: sapping our energy, undermining our health, and making us more vulnerable to anxiety, depression, and disease. Now, based on Dr. Jon Kabat-Zinn’s renowned mindfulness-based stress reduction program, this groundbreaking book shows you how to use natural, medically proven methods to soothe and heal your body, mind, and spirit. By using the practices described within, you can learn to manage chronic pain resulting from illness and/or stress related disorders…discover the roles that anger and tension play in heart disease… reduce anxiety and feelings of panic…improve overall quality of life and relationships through mindfulness meditation and mindful yoga. 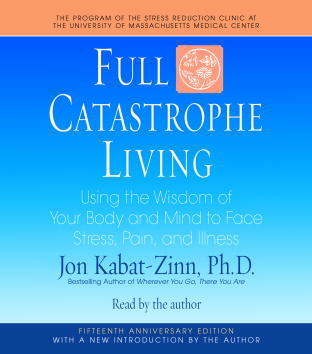 More timely than ever before, Full Catastrophe Living is a book for the young and the old, the well, the ill, and anyone trying to live a healthier and saner life in today’s world.